Key Players - Matt Cameron - drums, percussion. Ben Shepherd - bass. Kim Thayil - lead guitar. Chris Cornell - lead vocals and guitar. What caused me to blow off the dust? - I have been meaning to do a Soundgarden one for a bit. This was just the one I went with for no real reason. 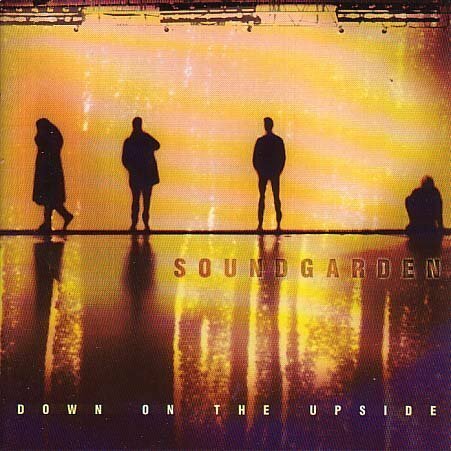 Overview - This is the fifth and final studio album from the Seattle based band "Soundgarden". Formed in 1984 the band would be come one of the biggest bands in the "grunge" era with heavy guitars and soaring vocals. The band would sell over 8 million albums (and counting). This would be the final album for the band due to a clash of creative differences and the bands legacy would only grow. In early 2010 Cornell announced via his Twitter account the band was set to reform and perform a few shows live. In August 2010 the band will headline Lollapalooza in Chicago. FDF Comments (aka the songs) - A solo, really swampy sounding guitar brings up "Pretty Noose" a track that was released as a single to radio. The same guitar plays a few bars before the band comes in. The band works on some time signature changes on the track as well, with drum and bass fills playing a large roll. Cornell is in fine voice, and has a very distinct voice that is hard to replicate. As the chorus is sung there are a few subtle backing vocals sung but they are more hushed yet still add a very strong vibe. They take a tempo and key change as well which is not what you'd expect from a "heavier" band, but they were in the midst of changing musical direction with this record. We get a quick solo on guitar before the verse/chorus is done again and the song ends. "Rhinosaur" has a full band intro and they get locked in to a tight groove before Cornell joins in. Cornell is more "gruff" on this, but can still show off his pipes. The track itself keeps a steady pace before Shepherd and Thayil get the chance to show off. Shepherd lays down a tight bass riff and Thayil rushes a quick solo over the top of that. "Zero Chance" starts off a bit more subtle. Cameron does some rolls and splashes on the drums almost begging Thayil and Shepherd to join in. It is a little slow to get rolling but it falls back some with acoustic guitars and more more introspective vocal delivery. It is not a rock ballad per se, but this is the softest moment so far on the record. There are flashing of acoustic guitars and mandolin is heard deep in the mix. The track builds slowly, but they don't really break out. Cameron gets things rolling on "Dusty" with some great play off Shepherd and Thayil. The rhythm section falls in to a tight groove and Cornell doesn't really rush things vocally but joins in the fun and feeds off the band during the chorus. Another song that was released as a single (but failed to do well) is "Ty Cobb". The song starts off surprisingly mellow, but 25 seconds or so in, the band comes at you about as fast as they ever have. The odd part is this was the track where the band really experimented with Mandolin and it can be heard prominent in the mix even as the guitars wail over the top and the bass chugs like a freight train over it all. Another big single for the album comes in "Blow Up the Outside World". Another song that starts off one the softer side before filling your ears with a chaotic storm. Acoustic guitars can be heard heavily as the verses are sung and it slowly builds to the chorus with a stunning sense of urgency. Another big single was "Burden in My Hand". Cornell comes right up on the vocals and is trailed with guitar and sings the entire first verse like this before the band joins in. Even with that it takes a while before the song really takes off. The ring that Cameron gets off his ride cymbal has always stood out to me personally on this track. Even in the guitar and bass wall that is thrown up, you can hear it punching its way through. "Never Named" is another song that starts right away. Barreling out of the gate the vocals and instruments hit you and it is off to the races. The band does a nice job of mixing things up on the record. Blending a good mix of quiet/loud and heavy/mellow. "Applebite" has a slower intro as well. Cameron just hits out drum beats before a guitar plays 2 or 3 notes at a time. The intro seems to remain the same for over 30 seconds before it feels like it is going to change, but it doesn't. The vocals are so heavily distorted in this haunting song it pretty much renders itself "filler". Skip this one. We return to the sound(s) that probably got you to buy the record on "Never the Machine Forever". In reading this was the last song that was recorded for the record and it is what Thayil had in mind for this entire record. It sounds like older Soundgarden with the buzzy guitar and the pounding drums. Shepherd seems to be high up in the mix and runs the bass ragged with his notes. There are some great time signature changes that keep the song interesting. This is good hidden gem on the record. "Tighter & Tighter" has a slower intro with the bass and drums working off one another before the harmonics of the guitar chime in. A second guitar runs a solo. For the chorus there is a unique vocal effect used when Cornell sings. The song seems to plod along, not really breaking any new ground. The one thing that does stand out is this is really the first song that has any sort of extended guitar solo. When I listened I noticed saying "hmm we haven't had one go this long yet". "No Attention" is another retro sounding song (for the band) for a focus on their hard rock sensibilities. It feels more a like a loose jam than a song, which is refreshing. Cornell even gives a booming scream a few times. The bass is dark and murky sounding at the start of "Switch Opens". A light guitar comes in before the full band comes up. The song itself is actually interesting with a warbly voiced Cornell leading the way, but the band seems to feed off one other in this song. Cameron rolls out marching drum beats, but it is answered with the guitars perfectly from an aesthetic setting. Just a different sound from the band that works really well. Overfloater" begins as a solo guitar slowly building and Cornell comes in sooner than you'd expect. The Shepherd is locked in to a melodic bass run while the tempo is kept in check. After a few verses it gets more chaotic and the band fully comes in. The bass fills from Shepherd fill in the back side and Thayil does some cool harmonics on the guitar before it returns to the earlier tempo. "An Unkind" is a frantic hard rocking track but the band is comfortable sounding. Cornell leads the pack but the guitars buzz underneath along with the driving tempo from Cameron. The guitars riff off each other before the chorus comes back around, there is a great outro on the song as well. The album concludes with "Boot Camp" a mid tempo song that showcases Cornell more than anyone. The whole band is involved but this is more a vocal showcase with instruments kept in their place rather than being pushed to the front. Where are they now? - The band was active for 84-97 before they took a break. During that time Cornell released a few solo records and worked with the band "Audioslave". Matt Cameron became the full time drummer for Pearl Jam. (We looked at "No Code" before). Thayil worked in a few side projects and Shepherd kept busy as well in a band called "Wellwater Conspiracy". The band will have a new song on a Guitar Hero game due in 2010 called "Black Rain". FDF Personal Comments (aka the Live experience) - I only ever saw the band live once as part of Lollapalooza. The biggest thing I recall was many people were walking around and Cornell took issue with people not paying attention to them. They were pretty decent from what I recall live. FDF Overall Take - Modern rock radio still plays at least three songs off this album in its rotation so it is easy to get burned out on them and feel like they never really "went away". If you like the singles you really can't go wrong. Some of it feels played out, but Cornell is pretty amazing and the more you listen the more you realize how good the band is. One site is here as well as a fan page here. Chris Cornell has a page you can check out here. There is stuff you can find on their myspace page. Billie Jean (very cool version of the Michael Jackson song) and also a stunning version of Thank You by Led Zeppelin. Check em BOTH out. You can buy "Down on the Upside" pretty much everywhere, but try here. Carla J. Looks very cool. Thanks for sharing your work. FDF Volume 2 Issue 190 Flowerhead - ...ka BLOOM!